Why the DOF's sugar tax bill in Congress is lousy. 1. The state is further addicted to tax-tax-tax mentality and policy. 2. 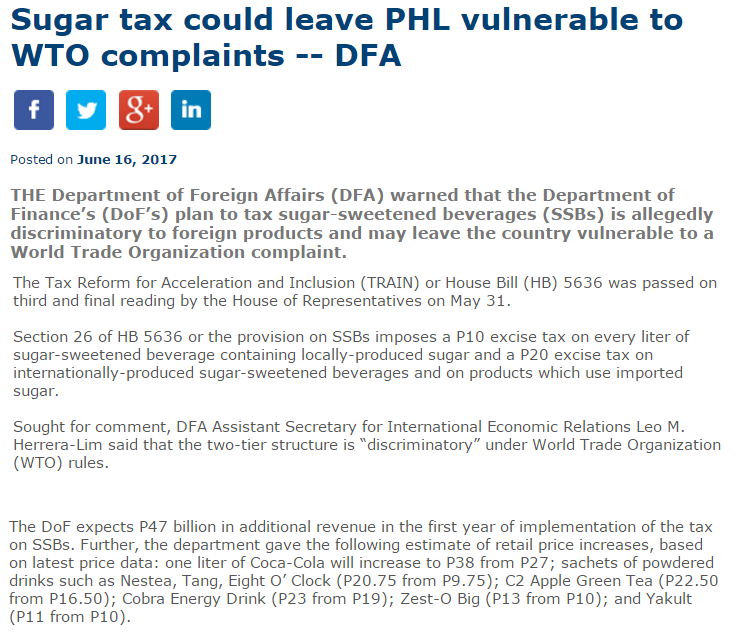 This 2-tier taxation (higher tax for imported sugar) is anti-WTO rules, DFA is correct. 3. State nannyism ('protect public health' alibi) is fuelling more state interventionism. Tax alcohol, tobacco, soft drinks, juices. Soon it will tax litson baboy, litson manok. See this report from BusinessWorld last week. That the state has hiked the tax on alcohol and tobacco products is generally accepted by the public. But taxing further soft drinks, powdered juice drinks, etc. is OA state nannyism. People own their body, not the state and politicians, not the health NGOs, etc. Simple joys by the poor like drinking powdered juice, the state will make these products become more expensive, and certain sectors like health NGOs, medical groups are clapping partly because they will get more tax money. Earlier, a lady Senator wanted to file a bill banning unlimited rice ("unli-rice") in restaurants. The usual alibi is "public health concern." Trying-hard state nannyism, those politicians and state bureaucrats think they are so bright they can plan other people's lives. Next they will penalize climbing trees and climbing roofs because they might fall and it's bad for their health and it's bad for public health budget. The silent motive here is that Dutertenomics will need lots of tax-tax-tax because it will go into endless borrow-borrow-borrow from China. Improving public infra is good and there are many big private companies, local and foreign, willing to bankroll many infra projects, but this administration intends to please China -- the communist dictatorial government, its banks and contractors.